A team of chemists at Nagoya University has developed a new method for synthesizing nanographenes by zipping up partially fused benzene molecules. A team of chemists of the JST-ERATO Itami Molecular Nanocarbon Project and the Institute of Transformative Bio-Molecules (ITbM) ay Nagoya University in Japan, together with colleagues, have developed a simple and powerful method for synthesizing nanographenes. Their new approach, recently described in a paper in Science, is expected to lead to significant progress in organic synthesis, materials science and catalytic chemistry. 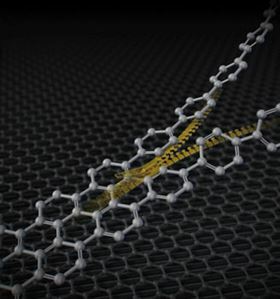 Nanographenes are one-dimensional, nanometer-wide strips of graphene, made up of benzene units. They are attracting interest as a powerful candidate for next-generation materials, including optoelectronic materials, due to their unique electric characteristics, which depend mainly on their width, length and edge structures. This means that efficient methods for accessing structurally controlled nanographenes are highly desirable. The ideal synthesis process for nanographenes would be via a ‘LEGO’-like assembly of benzene units, as this would allow the exact number and shape of the molecule to be defined. This direct approach is currently not possible, however, and so the team developed a simple alternative method that controls the formation of the nanographene structure in three key steps. First, simple benzene derivatives are assembled linearly into two chains, through a cross-coupling reaction. Neighboring links in the two chains are then connected to each other by a palladium catalyst, producing a molecule with three benzene rings bound together in a flat, triangle-like shape. This process then repeats all the way up the chain, effectively zipping the two chains together. The team’s innovation was to develop a new way to achieve the middle step: the synthesis of the three-ring, triangle-like unit that forms the core for further reactions to generate the nanographene molecule. A classic technique for connecting benzene units uses aryl halides as reaction reagents. Aryl halides are aromatic compounds in which one or more hydrogen atoms bonded to an aromatic ring are replaced by halogen atoms such as fluorine (F), chlorine (Cl), bromine (Br) or iodine (I). This allows benzene to connect at a single point through a process called dimerization, which was discovered by Fritz Ullmann and Jean Bielecki in 1901. However, the Ullmann reaction does not generate nanographenes if phenylene is used as the starting material. The team discovered that a palladium catalyst would induce connections between benzene units at two points, providing the triangle-like structure of three benzene rings. A triphenylene moiety then forms in the center of each group of rings. The team then utilized a process called the Scholl reaction to repeat this process and successfully synthesize a nanographene molecule. This reaction essentially zips up the benzene rings, with the triphenylene moiety acting as the core. The team had already succeeded in synthesizing various triphenylene derivatives, such as molecules comprising 10 benzene rings, naphthalene (a fused pair of benzene rings), nitrogen atoms and sulfur atoms. These unprecedented triphenylene derivatives could potentially find use in solar cells. “The approach for creating functional molecules from simple benzene units will be applicable to the synthesis of not only nanographene, but also to various other nanocarbon materials,” says Murakami.